A marriage proposal not only means spending the rest of your life with your love, but also stress and worry as the event draws nearer. Speak to your partner before proposing to get an idea of the kind of proposal she hopes to receive. A shy prospective bride or groom, for example, may not appreciate a proposal in a public place. Diamonds rings are often used for engagements. Consider what you and your girlfriend have experienced in the past. Did you once collect seashells on the beach or meet through a mutual friend? Create a picnic on the beach with her favorite foods and wine. Decorate with flower petals and candles. Beforehand, clean a seashell and carry it with you. Place the ring inside of the shell and hand it to her when you ask her to marry you. Otherwise, have the friend who introduced you lead her on a chase for clues, guiding her from location to location that have memories for both of you. Designate a person at each location to give her another clue and small gift. Wait for her at the last location with her favorite flowers and music. Hire a string quartet or other musical group to play his favorite songs at a restaurant. Notify the restaurant of your intentions before you make any plans. Take him to an Italian restaurant. 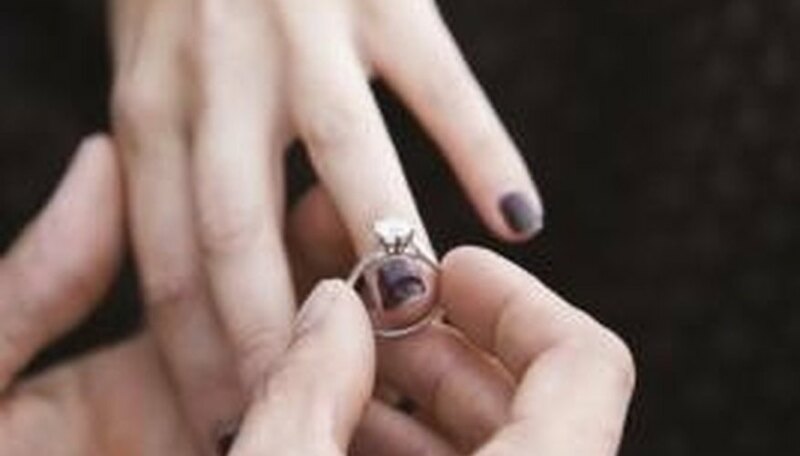 The engagement ring could be placed into a glass of wine or served to him alone on a plate when he orders dessert. To avoid choking hazards from placing the ring in his glass, immediately notify him that there appears to be something in his drink. Create a puzzle of photographs and other trinkets on a board that represent experiences you have shared together, such as movie and concert tickets. Beneath the pictures, attach the ring. Design a video outlining the reasons why she should choose to marry you and why you want to marry her. Propose at the end of the video. Compose a piece of music for her and play it yourself if you are a musician, or hire a string quartet to play it on her front lawn. Propose immediately afterward. Discuss places that your partner wants to visit. Consider taking him to an isolated cabin for a weekend getaway or the honeymoon suite of a resort hotel. It also may be a good idea to review ideal places to propose in the area where you live. Place the ring on the night stand so he will find it in the morning. Write a poem outlining how much he means to you and place the ring beneath it. Coleman, Candice. "Unique Romantic Ways to Propose Marriage." Dating Tips - Match.com, https://datingtips.match.com/unique-romantic-ways-propose-marriage-7944454.html. Accessed 20 April 2019.